PHILADELPHIA (Embargoed until 1:30 p.m. EDT, Sunday, June 24, 2018) – A first-in-human study presented at the 2018 Annual Meeting of the Society of Nuclear Medicine and Molecular Imaging (SNMMI) demonstrates the benefits and safety of a new, long-lasting type of radionuclide therapy for patients with advanced, metastatic neuroendocrine tumors (NETs). “177Lu-DOTA-EB-TATE is a “three-in-one” therapeutic compound, with an octreotate peptide to find the tumor, an Evans blue motif, which uses endogenous albumin as a reversible carrier to effectively extend the half-life in the blood and substantially increase targeted accumulation and retention within the tumor, and a therapeutic radionuclide to kill the tumor cells, to finally provide effective treatment of NETs,” explains Shawn(Xiaoyuan) Chen, PhD, senior investigator, of National Institute of Biomedical Imaging and Bioengineering at the National Institutes of Health , Bethesda, Maryland. Abstract 118: “Safety, Pharmacokinetics and Dosimetry of a Long-lasting Radiolabeled Somatostatin Analogue 177Lu-DOTA-EB-TATE in Patients with Advanced Metastatic Neuroendocrine Tumors: A Phase 1 First-in-human Study,” Jingjing Zhang, MD,PhD, Yuejuan Cheng, MD,Hao Wang, MD, Jie Zang, PhD, Fang Li, MD, Chunmei Bai, MD, and Zhaohui Zhu, MD, Peking Union Medical College Hospital; Gang Niu, MD, Orit Jacobson, PhD4, and Xiaoyuan Chen, PhD, U.S. National Institutes of Health, Bethesda, MD. SNMMI’s 65th Annual Meeting, June 23-26, Philadelphia. 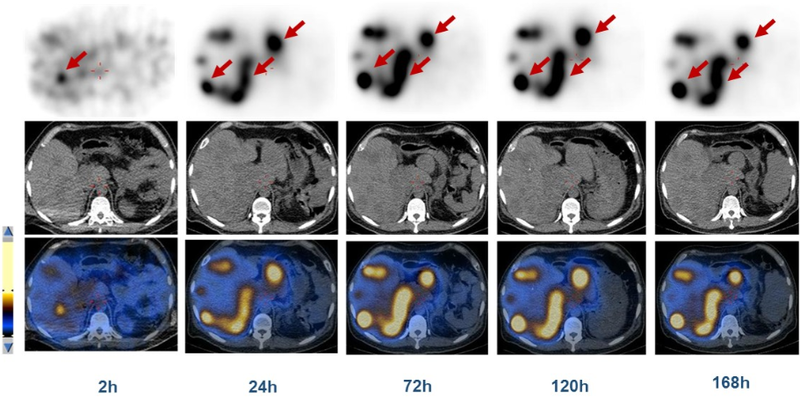 NOTE: See Abstract 2 of the SNMMI 2018 Annual Meeting on an improved PSMA-targeting agent for prostate cancer imaging and therapy, also an NIH study using Evans blue platform technology.